Save an extra CDN$ 13.76 (58%). Buy the Kindle Edition instead. Comment: A copy that has been read, but remains in clean condition. All pages are intact, and the cover is intact. The spine may show signs of wear. Pages can include limited notes and highlighting, and the copy can include previous owner inscriptions. The dust jacket is missing. At ThriftBooks, our motto is: Read More, Spend Less. Time after time, when Jonathan Edwards read his sermon Sinners in the Hands of an Angry God, both sinners and sinning saints in his audience would weep, cry out, fall down in repentance, and plead for Gods forgiveness. For more than two centuries, Jonathan Edwards messages have brought conversion, hope, and spiritual awakening to thousands of Christians. Updated and revised, these eleven classic messages will bring a fresh awakening to todays Christians who are seeking the deeper things of God. If that is the hunger of your heart, then this book is for you. Start reading Sinners Hands Angry God on your Kindle in under a minute. "Whatever effort people make to be religious or to pray, until they believe in Christ, God is under no obligation to keep them for a moment from eternal destruction." Upon reading his sermon, "In the Hands of an Angry God," Jonathan Edwards would observe people weeping, crying, falling down in repentance, and crying out to God for forgiveness. Pastor of First Church of Northampton, Massachusetts, Edwards was a leader in the First Great Awakening with George Whitefield. Being dismissed from his pulpit, Edwards became a missionary and later president of the College of New Jersey (Princeton University). This teeny weeny book is very powerful, and honest, so honest, it actually makes you take a look at your walk with God. It is very thought provoking in that it will cause you to look at the lost souls of this world more seriously. I seriously recommend you buy it, read it and pass it on. Buy more than one so you can share with others, it's a very important little book. delivered on time with good quality. Along with John Cotton and George Whitfield, Jonathan Edwards was one of the most important preachers in American history. The grandson of Solomon Stoddard, the famous revivalist preacher from Northampton, Massachusetts, Edwards entered Yale in 1716 at the age of thirteen and received his first ministry in New York at the age of nineteen. In 1729, at the age of twenty-six, he succeeded his grandfather at the important Northampton Church, where he preached the need for a return to the rock-ribbed Calvinism upon which the "New World" had been founded. The Calvinist creed entailed absolute and unquestioned commitment to beliefs in the total depravity of man as a sinner, unconditional election, predestination, divine revelation and conversion, and eternal suffering for sinners. Edward's ministry had an immediate and dramatic effect, increasing the size of his church, producing over four hundred converts by 1734. The Northampton Revival foreshadowed The Great Awakening--the popular religious movement of 1740-1741 based on the idea that "opening of the spirit to the divine" was more important than a trained intellect--that rocked the very foundations of colonial society. 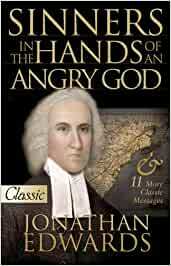 Edward's most famous sermon, "Sinners in the Hands of an Angry God," was delivered as a guest sermon to the parish in Enfield, Connecticut, on July 8, 1741, at the very peak of The Great Awakening. Edward's text for the sermon was Deuteronomy 32:35: "Their foot shall slide in due time." Edwards, who typically spoke in an unemotional and relatively plain style, took advantage of the recent prophecy of the end of the world that no doubt weighed upon his listeners minds. Reaching to the depths of his emotional spirit, he preached a sermon designed to terrify his audience into conversion. He did this by carefully drawing upon his listener's belief in the inevitability of eternal suffering for sinners, and by vividly characterizing the vengeful God who would dangle them over the burning pits of hellfire as if they were nothing more than a spider or a "loathsome insect." The powerful spider imagery may well find its genesis in Edward's 1734 book "The Justice of God in the Damnation of Sinners," where he developed similar imagery when he wrote of man as "A little wretched, despicable creature: a worm, a mere nothing, and less than nothing; a vile insect that has risen up in contempt against the majesty of Heaven and earth." The effect of the sermon was astonishing, with parishioners crying out for "mercy," and several reports of suicide. Perhaps more than any other sermon delivered during the 18th Century, "Sinners" epitomizes the emotional intensity and power of the revivalist message of The Great Awakening. After reading this sermon do not be surprised if you conclude it is as powerful today as it was in 1741. This particular sermon from Edwards has been trumpeted by some as the greatest sermon given on American soil, while being vehemently attacked by others as puritanical fire and brimstone of a backwards age. Oddly enough, there are elements of truth in both sentiments, more the former than the latter however. While unquestionably hitting on many timeless truths that are relevant in any period of time, the genius of the sermon really comes out when one considers the historical context in which the sermon was given. Contrary to many negative reflex and often revisionist reactions we tend to hear today about puritanism and Edwards, Edwards was not a constant fire and brimstone preacher. The writings of Edwards reveal a man who spoke much more on the grace and mercy of God then of His wrath. But really, the two go hand in hand. There's no need for God to be merciful if there's no eternal wrath to fear. There's no need for God to show grace to human beings if there's nothing bad enough in human beings to warrant divine punishment. It is impossible to adequately discuss God's mercy and grace without also dwelling very intently on the wretchedness of man and the divine justice that must be exacted if we believe that God is perfectly holy. This is the context in which this sermon by Edwards was given. He was invited to preach at a church that was spiritually dead and dominated by a spirit of skepticism and a deeply entrenched disbelief in the need for radical personal conversion. Such is the attitude that can be found in many churches today. Yet contrary to what happens each Sunday in these kind of churches all across America, the preacher at this particular church found such comfortable skepticism not to be a virtue of an enlightened congregation, but as a cancer that ensured that many in his church would go unsaved if things didn't change. Enter Jonathan Edwards, and his sermon to this church on that day changed the people in that church and made a lasting impact on American Christianity that is felt to this day. The main purpose of the sermon, contextually speaking, was to abruptly dislodge and disrupt the culture of apathetic skepticism that reigned in this church. Edwards attempted to do this by drawing haunting imagery of God's mercy in all things, ensuring the congregation that the only reason they are even breathing is because of God's grace. He paints a picture of man dangling over an eternal fire, and stressing that this is where man finds himself right now, and that the only reason he doesn't fall in is because God (and a very angry God at that) has a hold of him and hasn't yet let go. For Edwards, it was clear that by holding on to sinful and unrepentant man and not allowing him to fall at any moment, God was being infinitely more merciful than we deserve, but that such mercy is not indefinite or inexhaustible, but instead serves either to keep an elect person alive long enough for him to reach a point of faith and repentence, or serves to harden the sinner's heart to the point where eternal damnation is a completely just punishment for having denied and defied the authority of their Maker for so long. Some have commented that this kind of imagery is backwards because Christians shouldn't be in the business of trying to scare people into personal faith. While such a sentiment sounds good and tends to appeal to our modern sensitivities, such a view is decidedly unfaithful to the entire earthly ministry of Jesus Christ as recorded in the gospels. Jesus talked about hell and punishment more than anyone else, and certainly far more than Edwards. If one accepts that Jesus is God and can therefore be considered a pretty reliable authority on the supernatural and the afterlife, then one must conclude that Christ's continual warnings about eternal punishment are authoritative, accurate, and should be heeded with deep seriousness. I found this sermon by Edwards to be very faithful to the uncomfortable and even scary warnings given by Jesus throughout the four Gospels of the New Testament. Edwards is not scaring people for the sake of scaring people. He is doing exactly what Christ did 2,000 years ago - out of a spirit of deep love and concern, he is warning people of the very real and terrifying consequences of deliberately walking away from Jesus Christ. In the end, the basic question one has to ask when reading either Edwards or Scripture is whether the eternal punishment described by both is truthful or not. If it is, then how can it possibly be an act of love not to tell people about it? Better to offend with the truth and call people to faith in the one true God and personal repentance than try to make people feel comfortable believing a lie and not seeing a need for people to change anything about their beliefs, wrong and negatively consequential though they may be. If someone believes that eternal punishment is false, then that person has bigger fish to fry then Edwards, they must also patently reject the sayings of Jesus and adopt completely by blind faith a different view of the afterlife. Many have taken this latter road, just as Christ predicted would happen. But truth does not depend on whether our ears are sufficiently tickled. Those who sincerely want to know the truth will give Edwards a fair hearing here and put his views to the test. As one of the most well-known American religious discourses in history, this fire-breathing sermon roars from start to finish with the threat of hellfire and eternal anguish of soul. Delivered by Jonathan Edwards, an early Puritan preacher in America, this sermon is cold and calculating--utterly methodical in the dissection of just WHAT God's wrath is and just WHY you don't want it to be directed at you. To most religiously-inclined readers today, this sermon will seem a bit extreme, if not eccentric. But one has to remember the context in which it was given. These were the Puritans, the religious zealots that literally tried to 'scare the Hell' out of people. Edwards does this very well. It may be true that this sermon is quite harsh, but that does not mean that one cannot profit by reading it. The underlying message of this text is that the day for living a virtuous life is TODAY, and not later, or when we get around to it. It also warns against the dangers of allowing oneself to enter a carnal security--to believe that all is well when we are in fact under condemnation. Overall, this sermon has many great Christian values, though it should be taken with a grain of salt. This discourse is definitely recommended for anyone with an interest in Christian readings.